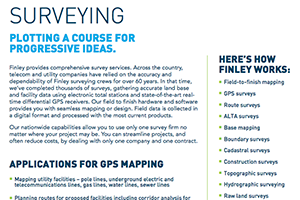 Finley brings decades of expertise to the right-of-way and permitting process, surveying and environmental analysis. 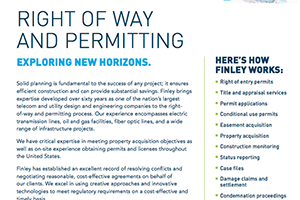 Finley brings decades of expertise to the right-of-way and permitting process, surveying and environmental analysis. We understand and appreciate that every property is unique. Our team is a forward-thinking, passionate group of engineers that focuses on balancing the needs of the client with the importance of environmental safety. Finley Engineering approaches every project with an understanding of your needs for timelines, accuracy, and confidentiality. Our core experience is in providing telecommunications and utility companies Land Surveying, Right-of-Way and Permitting, and Environmental services. With a broad range of professional backgrounds in civil engineering, planning, land surveying and construction management, our highly experienced professional staff offers a wide range of services necessary to avoid needless project setbacks. For over 60 years, our open communication approach has been a key component to every project. This relationship-based, detail-oriented approach results in better cooperation among all parties including planning and zoning, land owners, community development, engineering and public works departments. Count on our dependable team of survey, engineering, and environmental consulting professionals to develop a custom solution to your needs. We integrate all of our technical expertise to develop a project plan and meet your exact specifications as well as the strict standards of all local, state, and federal agencies. Learn more about our Land services below or contact our team of engineering professionals who are ready start building a relationship that will help your organization succeed. Ready to dig in a little deeper? Learn more about Finley’s services with these detailed Fact Sheets formatted so you can download, save and print. Finley’s state-of-the art technology enables your organization to optimize your design, analysis, and modeling projects. Finley’s geomatics department is able to take precise measurements to analyze images quickly—whether they are on land, in the air, or under water—using a combination of imagery and point cloud geo reference data. 3-D scanning offers the same deliverables as traditional surveying, however it greatly enhances those deliverables with heightened perspective and insight into a structure or area. 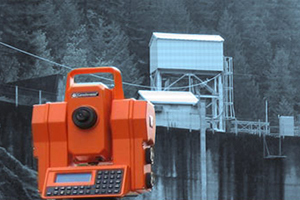 Our nationwide capabilities allow you to use only one survey firm no matter where your project may be. You can streamline projects, and often reduce costs, by dealing with only one company and one contract. Finley brings decades of expertise to the right-of-way and permitting process, surveying and environmental analysis. Our experience encompasses electric transmission lines, oil and gas facilities, fiber optic lines, and a wide range of infrastructure projects.